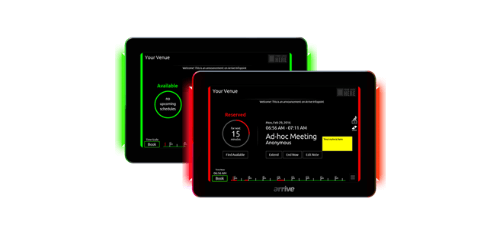 The Arrive AIP-ID-1000 is a 10" room scheduling touch panel, what makes this model unique is that it is a stand alone device and requires no dedicated server to to use. It can receive room reservations from Google Calendar using a Google Apps account, MS Exchange on-premise mailbox account, or with an Office 365 online account. The bright LED indicator gives a quick status of green for open, or red for reserved. The easy to use touch screen gives users the ability to reserve and schedule one time events, or reoccurring events quickly and easily. You can quickly schedule times needed, the exact minutes needed, or from 6 pre-set time allotments. When a room is reserved and you are ready to use simply walk up to the panel and check in, if nobody checks in the room will be deemed a no show and it will automatically become available again. The panel can also be used as a digital signage display showing a custom logo, running ticker line, important notes, and even the weather. The panel can be connected to via a hardwired LAN connection or 802.11N WiFi for network access. To power connect a PoE drop or use the supplied PoE power supply. Schedule your meetings on the device or via your email or apps with ease, no software or servers are required. The touch panel also serves a dual purpose and is capable of being used as a digital signage display. The panel is easy to install and comes with a mount and screws to attach to a wall, it can also attach to glass with a sticker. 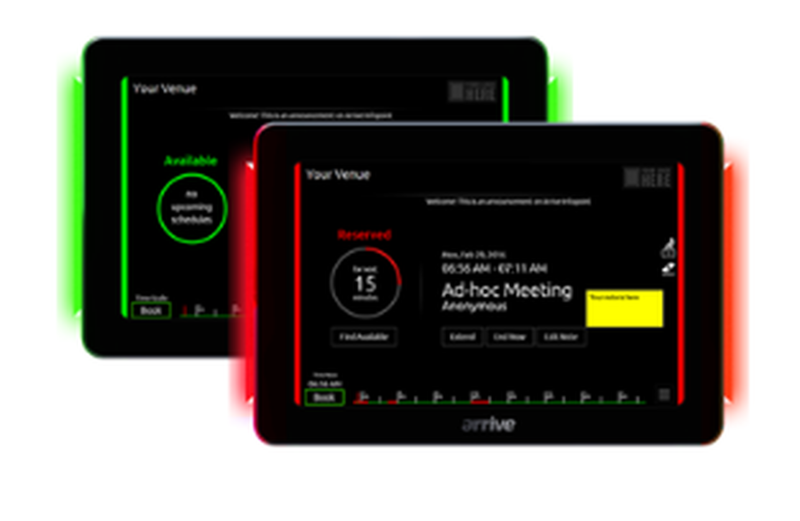 The Arrive AIP-SA-1000 is perfect for conference rooms, meeting rooms, training rooms, or anywhere you need a high quality easy to use room scheduling system with a large touch panel.